No matter if you are a freshwater fisherman or a deep-sea angler, a tackle box is important for keeping the necessary equipment, including lures, sinkers, and hooks organized. There are diverse options offered on the market, ranging from usual hard plastic boxes up to shoulder bags and backpacks that will help you keep things light. Selecting the best item is essential since your convenience and the final result may depend on it. Consider the fishing style, conditions the box will be exposed to, the tackle you have and other specifications which can influence your choice. We have learned the features and compared different options offered on the market and are ready to provide the best options for both an amateur and professional fisherman. Elkton is the company that thinks ahead. While an overwhelming majority of tackle boxes help organize tackle, Elkton Outdoors item is also perfect for transporting the gear. It is equipped with two heavy-duty wheels and a special extendable handle, so you can apply minimal effort to carry the box around. 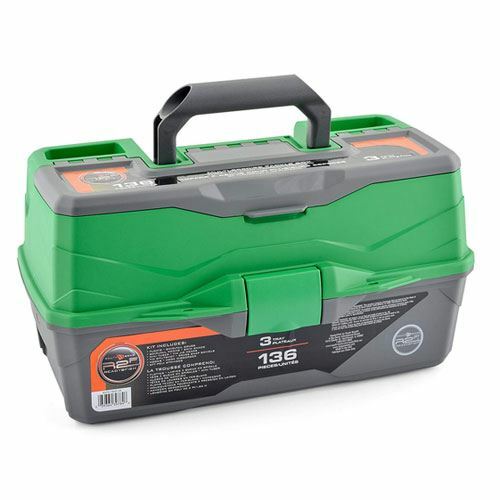 The tackle box is convenient (L 15.7 x W 9.6 x H 18.5 inches), lightweight (11 pounds) and still commodious. The item is made from exceptionally durable fabric, PVC, and rugged zippers to preserve a good shape of the product even after years of use. A large compartment on the top of the tackle box can be divided into two-three sections for better storage. With five removable tackle trays, you can create extra space for leaders, lures, tools and other items you may need. Users appreciate Elkton tackle box as a comfortable, useful and indispensable option for fishing. The toughness of this product immediately shows itself to the touch and during the very first use. Water-resistant fabric does not get stained and is likely to leave your accessories intact even in hard rain. Its storage capacities look very much to the point, resulting from a quite effective use of the dimensions. It is not certain how this box will handle rough use. Its ability for easy transportation (esp. on sand) also seems moot. Plano is a trusted company, which features quality products designed by fisherman for fishermen. All the essential tools are included and thought out to the last detail. The box combines the most different types of materials, including rubber feet, waterproof TPE coating as the body of the bag and molded top secured by the elastic bungee will guarantee dependable storage of your tackle as well as a quick and easy access to it. A comparatively small size (14.5″L x 10″w x 11″H) and weight (5.2 pounds) are excellent for simple transportation. However, the box is still commodious, capable of keeping six stows. Dedicated sections of this bag have their own unique feel. As soon as they get used to it, the angler will definitely benefit from this smart organization. Even when filled to the brims, its roomy innards do not swell the bag’s compact size – neither in appearance nor when handling it. No intended fungi-and-mold resistance has been noticed; the bag, obviously, requires careful use and regular airing, which can be too demanding for some users. Has a waterproof pocket for personal stuff. 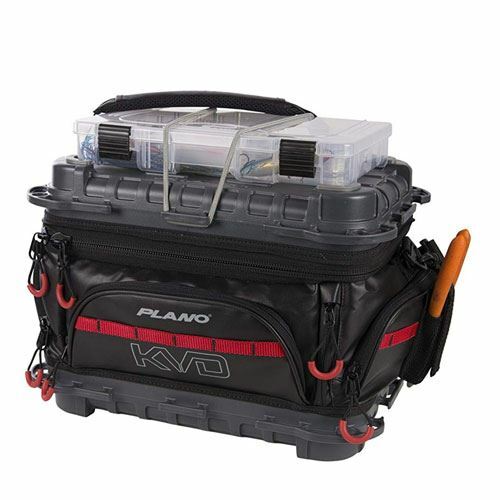 The Plano 7771 Guide Series Tackle system has been designed to suit the wishes of fishermen, provide lots of storage room for all the needed tools and front latches allowing your things to be perfectly organized. The solid construction of the system includes four utility system, convenient handle to easily carry it around, as well as a nameplate order form. It is not only a perfect thing to store bait, reels, and line, but it can safe keep a number of other pieces that may be needed for both for fishing and something else. With the dimensions of 21.2 x 12.9 x 12.7 in and around 13.4 pounds in weight, it can be quite a pickle when being carried around. An awesome value for the money. All the elements, including trays, feel like they can endure a lot, rather than chip or develop cracks. Clear plastic walls of the trays allow you to access the organized goods with utmost comfort. This box won’t become your best idea of how to carry things with you on the shore. Its bulkiness really seems to be the only problem, so strong guys might not even bother. 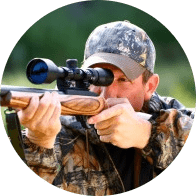 The Plano 7771 Guide Series Tackle system is sold at a quite reasonable price and is quite a good choice to invest in. Heavy to lift and quite challenging to carry around especially when loaded. 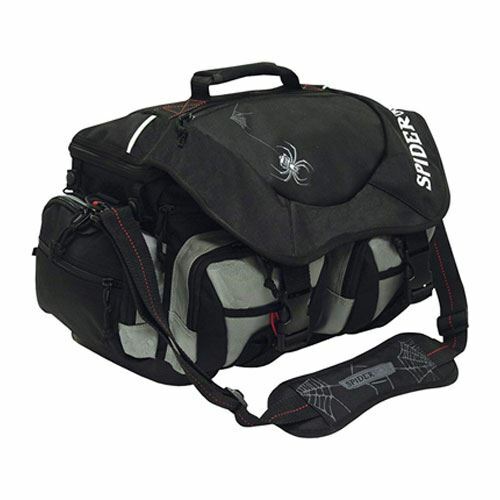 Spiderwire Wolf Tackle Bag is a special fishermen’s equipment designed to be taken to every prime fishing spot and bring you much success when there. The bag is made from polyester with the molded bottom and PVC back to get 100% element resistance and protection. Its dimensions are 15.75 x 10.8 x 8.2 inches, with a mere 2.62 pounds of weight. The adjustable and convenient polypropylene webbing strap allows carrying the bag around with much comfort and no hassle. The inner compartment comprises convenient dividers with the help of which fishermen are able to organize reels, four tackle boxes to store lures and baits, and other types of gear. On the outside one can find two slots for pliers, two front pockets, and on the other end, there are fishing dispensers that can be removed when needed. The product has an inflexible bottom, so it actually doesn’t sag (even though it may look like it might). Rugged and weatherized zippers slide easily back and forth, seemingly able to make it in the long run. Its organizational potential is very decent. Given the choice of material for the trays, less careful anglers may need to replace them as they break up. You must also air this bag to protect it from mold and rust. A plethora of pockets and compartments with 4 interchangeable plastic trays and additional space for tools. The boxes on the inside are made from plastic, so they are not as durable as one would wish them to be. Moreover, they aren’t functional as well. The Plano Angled Tackle System is a popular choice among amateur and professional fishermen due to a range of positive features it offers. Its utility storage compartment placed at 15-degree angle under the cover allows a free access to the items stored. Three storage boxes have pre-mold separators to organize the space better. The manufacturer also provides a chance to configure smaller compartments which are tall and deep enough to store various stuff, such as baits, lures, hooks, corks, beads, bobbers, sinkers, etc. Two more spaces were provided for in the lid, and they can keep larger lures or even a flashlight. The dimensions are 18 x 9.5 x 11 in, with a weight of 5.65 pounds. DuraView doors and covers allow the angler to see the contents in a matter of minutes, while timing is quite important when going for big fish. For this Plano, everything starts with a customer-friendly price. It’s not what you call ‘cheap’ cheap, though; the molded plastic is able to outlive many hits and tumbles. Its utility boxes are a pleasure to work with. It lets in water and humidity, so be careful. Even though some reviews mention that you can carry maps in it without crumpling them, we wouldn’t recommend that you actually store in this box anything that won’t last water damage. Bulky and not efficient use of space. The name of Plano 6134-03 Large 3-Tray Tackle Box speaks for itself. It has large compartments for organized and successful experience when fishing. The box measures 17.5 x 9.3 x 9 inches and weighs 5.7 pounds. The box is well-built and quite sturdy, thus, it is aimed at providing anglers with additional convenience in doing what they love. Moreover, the item is filled with small features, and that makes it a perfect match. The two compartments placed on the top are quite practical, providing an opportunity to store a number of items an angler will definitely need while fishing. They are also great helpers in maintaining the tackle box clean keeping it from dirt and water that may enter the box, as you won’t need to open the Plano 6134-03 Large 3-Tray Tackle Box every time you need to fetch out something. What concerns storage, its opportunities are standard and go in line with other boxes of this range. The inside is pretty spacious and well-designed, the handle is comfortable and sturdy to be carried around without making your hand tired. Its side compartments are performed in an innovative style and we genuinely like it. The drawer section boasts an excellent volume, easily taking in both the essentials and extras. The box itself feels pretty much indestructible. While the box’s covers are thick and sturdy, the construction of the drawer compartment is far from satisfactory. Its stand wobbles and the movable elements have some flimsiness to them. Durable and contains lots of additional space. Drawer compartment is not as solid as in other Plano boxes. 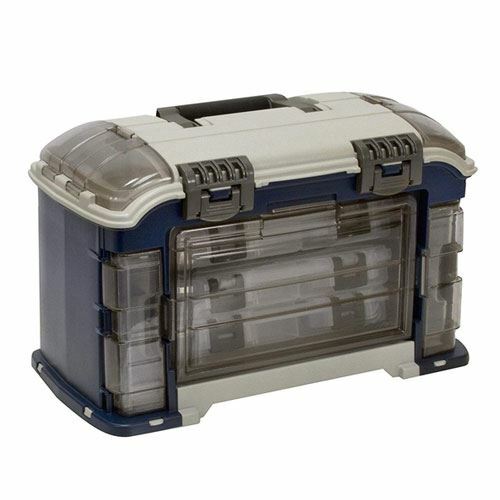 Sougayilang Fishing Tackle Box Portable 4 Layers Fishing Box features lots of storage room under its lid that allows storing a variety of items, including knife, sunglasses, a flashlight, spare reel, etc. The item is made from durable and solid ABS plastic and allows the overall loading of 50 kg. It is even sufficient for an average person to sit on, however, one has to be quite careful not to crack the tackle box. 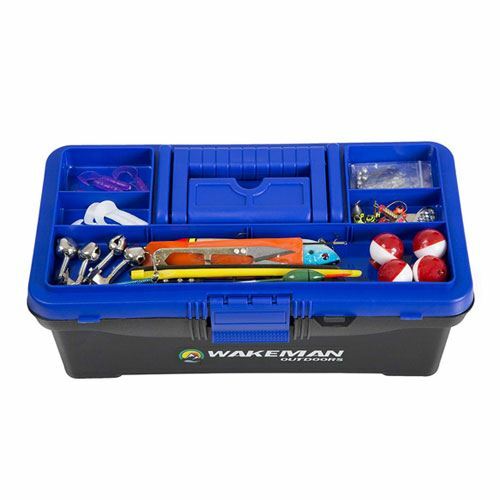 This fishing tackle box contains the main tray consisting of 4 clear utility boxes to carry all kinds of accessories an angler might need for fishing, including floats, sinkers, line, lures and bait. Besides that, other small compartments can be used for different needs. Due to its water-resistant features, the box is perfect for use during sea, bank and boat fishing as water won’t affect its quality. Its measurements in inches are 10.2 x 10.2 x 7.0, with a weight of 2.8 lbs. This tackle container really gets the accessibility of your fishing accessories to a new level. It is really handy when it comes to smaller items, like hooks and sinkers. Its wide foot makes it stand quite firmly on the ground. While you can regulate the length of the removable partitions, the height of this box can be a trouble, especially when coming down a steep bank. It’s almost as if it should have a shoulder strap but misses this point completely. Can be used during boat fishing. Plastic handle isn’t a comfortable option to carry this box around even despite its light weight. Wakeman Outdoors is the revolutionary company that cares for new and experienced fishermen. Its Tackle Box Plus 55 Piece Tackle Kit is an ultimate solution for those, who need only a basic pack. Exceptional storage capacity and unique flexibility are the key features of the offer. The dimensions of this product are 12.8 x 7.2 x 5.5 inches and it has just 2.4 pounds of weight. The item is also characterized by the simplicity of use and easy accessibility. 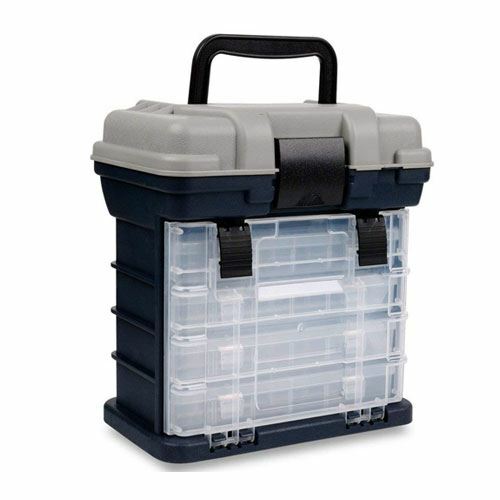 Equipped with a lid and big built-in compartments, the tackle box offers a perfect storage area. Additionally, there is a single tray inside, which is removable, so you can enhance the storage capacity of the box with only one motion. Tremendous convenience of the tackle box is another feature that is highly appreciated by the vast majority of fishermen. The item can be easily taken on water. Genuine quality and competitive cost of the tackle box are guaranteed. In addition to its unusual look, this product gives an unusual amount of storage space. Its sectioned lid is a simple solution to the constant problem of getting what you need fast and without making a mess of it. The container is very attractive in terms of price. Even though the box fits a lot more than you’d think it does, it still is quite small. Also, we don’t think its external grids will have much use as items tend to fall out of them easily. Simple but roomy option for basic materials. One compartment which is not sufficient for professional fishermen. Made by Plano, Ready 2 Fish tackle box serves an exclusive option for novice fishermen and real fishing experts. The item is equipped with necessary compartments and divisions for necessary staff. Special adjustable and removable trays come with hooks, sinkers, and jigs. A comparatively small tackle box (9x17x9 in), with its weight of about 3 pounds, is commodious. It has 3 trays for around 132 tackles. The traditional box is exactly what one may need to carry tools. An exclusive fishing guide is an additional option included in the set. It features useful tips for beginners and experts. A durable plastic box will serve long years. The item has a constant shape, which will not change during transportation. It guarantees convenient carrying and full order. With three trays in the tackle box, you will get enough space for all the items, comfortable and orderly box for a beneficial fishing experience. 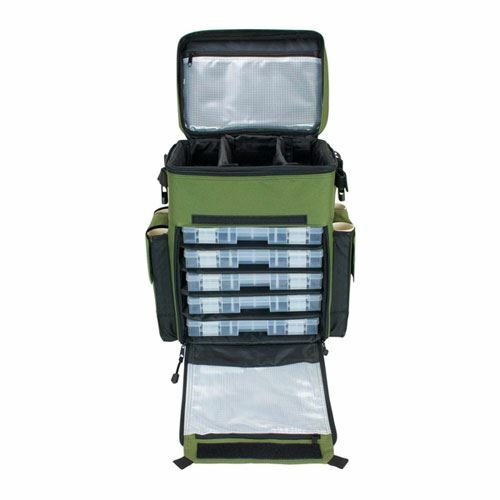 Fishermen appreciate Ready 2 Fish box as a beneficial, useful, spacious and convenient tackle organizer for easy use. This container’s ability to remain in one piece is invaluable for kayak fishers. You can get to its contents by simply pulling it open with one hand. Overall, it’s an excellent unsophisticated choice, most suitable for a beginner angler. This tackle box is not likely to become your all-purpose storage chest. As far as professional functionality is concerned, it is no rival to expert advanced boxes. Has three trays for more compartments. No strap for shoulder carrying. Being an appreciated and reputable company, Goture offers only the best items, and its Fishing Lure Box is not an exception. Offered in three sizes (small, medium, and large), the tackle box is convenient, easy to use and transport. The plastic box guarantees the maximal level of comfort storing and using fishing lures, hooks, swivels, and other items. The container has 12 compartments for small and bigger stuff, starting from hooks and up to lure baits and grubs. Irrespective of the size, the box has a special rubber belt to maximize its waterproof features. Moreover, there is no chance to lose the fishing gear as Goture Lure Box will float in water. The item is the leading option for fishermen, who care about convenience and quality. Despite a comparatively small size of the container, it is exceptionally commodious, so you can take it and carry all the necessary tackle. The dimensions of the three offered sizes are 4 x 3 x 1.3 inches, 6.3 x 3.5 x 1.7 inches, and 7.8 x 4.2 x 1.8 inches, with the weight ranging from 1.5 to 3 pounds, respectively. The box is really neat looking. It comes in a variety of colors and sizes, so you’ve got plenty of room for creating your style here. As for its capacity, the container literally uses every inch to serve its purpose. It mostly depends on how lucky you are with your model but some of those boxes have latches that won’t snap reliably. As the result, the lid of your box may open on itself from time to time. Being an angler, you need to choose a trusty and convenient tackle box for essential gear. There have always been lots of discussions considering the features and specifications of the most useful options. Definitely, the top performing box choice will depend on the individual preference of its users. Some fishermen prefer hard plastic items while others are more fond of soft waterproof options. The price range and accessibility of the tackle box should also be taken into account. Striving to enjoy excellent fishing, an organized tackle system will be the key. No matter if you are interested in a complex tackle box or simple bag with some degree of gear organization, durability and reliability are the primary features you should mind. This is the only way to have a safe experience when your gear remains safe and dry. Durability and quality. Genuine and sturdy tackle boxes made from waterproof, durable materials are the top priority for an experienced angler. More than likely, the box will be dropped on the ground, put in water or kicked, so the option should be quality enough to live it all through. What is the beneficial size of the tackle box? Do you want a smaller option? How much gear do you need to include in the container? What are the target fish species? Do you fish from the shore or on a boat? Do you need to carry the box for long periods of time? These simple questions will give you a clear understanding of what you need. Do not opt for a bulky tackle box in case you are a trout fisherman, who is wading in a stream. But in case you are a bass angler, make sure you have all the equipment that may potentially be needed when you are fishing on a boat in the middle of a lake. Type of the tackle box. This is one of the first issues that should be solved immediately in order to specify the choice. 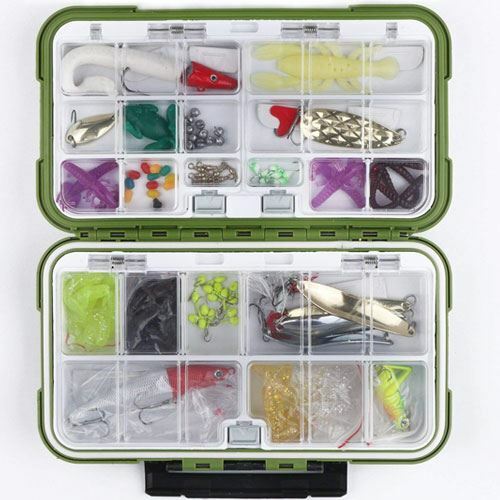 There are several most commonly used types of a tackle box; and each one has certain its advantages and drawbacks, specifications and peculiarities that should be taken into account. Trunk-tray box. This is one of the most demanded and popular box types, which frequently serves as the first angler’s container. When you open 1-3 trays, they accordion over the lid that lays flat. Additionally, there is extra space for storage on the bottom of the box if it is deep enough. The main features of the trunk-tray box include small size, high commodity, light weight, extra mobility and easy access to the necessary items. Drawer type box. It is an excellent choice for those, who prefer fishing from a boat. Due to the limited space on board, the box should be compact but commodious. The item sits vertically, with the drawers sliding out. Additionally, such a structure allows your lures and other gears to stay dry even during wet weather. Hip-roof type. This tackle box resembles the traditional trunk-tray box but serves as its modified version. The container can be opened from both sides, leaving a spacious bottom compartment. The hip-roof option provides a high level of tackle organization and easy access to any gear you need. Soft side box is getting increasingly popular due to the storage system it offers. The option is lightweight, flexible and completely waterproof. The main specification is the diversity of small plastic utility boxes inside, as well as special pockets to store extra tools. Hanging type tackle box is exceptionally appreciated by Muskie anglers. The item has enough space for big lures, removable dividers made from clear polycarbonate or plastic, equipped with slots for lure hanging. Hard containers are 100% waterproof, while soft ones may be water resistant or waterproof but still cannot guarantee complete dryness of your tackle. Hard tackle boxes are preferred by people, who need to take much stuff. The top-loading compartments can be used in such instance, so you are completely ready for fishing at any moment and location. Key features included. While you have opted for the preferred type of the box, you need to view the peculiarities of items within the category. While the waterproof material is definitely a beneficial option, some extras may add to the convenience of the gear use. The size and functionality of the box should not be the last considerations. Northern pike and Muskie anglers will need large boxes, while panfish fans will need a smaller item for small lures and terminal tackle. Zippers, hinges, and handles are the items that may either increase or decrease the effectiveness of the box, depending on your fishing style. Cost. Being a novice fisherman, you will not need an expensive box with the most innovative features and exclusive storage facilities. But in case you are an advanced angler, you won’t enjoy a simple item. The price range of tackle boxes is rather high, so you can get the item for as cheap as less than $10 and as expensive as more than $300. Accessibility. How comfortably you can access your lures and gears may significantly impact your fishing performance. You want the compartments of your box stow closely when folded, that true; however, take a careful look whether they open as nicely. When unfolded, the compartments shouldn’t overlap vertically, allowing you to get what you want fast. Beware of too-tight latches and scissor mechanisms due to their ability to pinch flesh and catch clothes; magnets are the best and so are non-plastic hinges. Finally, clear lids will also make for a better management of your tackle. What are the essential items found in a tackle box? Generally, the list of essentials will also be individual and vary depending on the fishing type you practice. But, on average, it includes line, hooks, sinkers, bobbers, plastic worms, lures, needle nose pliers, and a line cutter. Should I choose a tackle box that includes all the tackle or buy it separately? Being a new fisherman, you would be more comfortable with the full set of equipment. Your task will be reduced to simply using it. But an experienced angler would probably prefer some specific lures and wobblers he/she is used to. 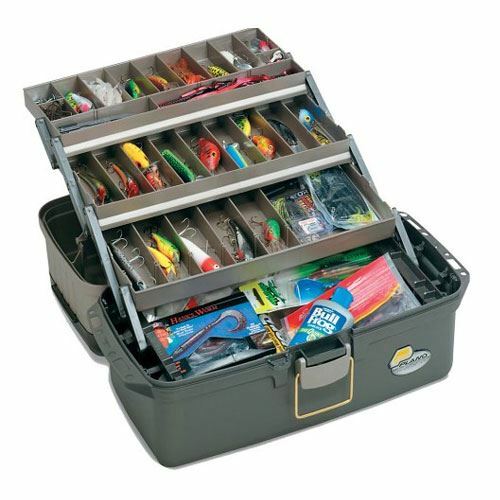 What is the best way to organize a tackle box? Get ready with the box before you go fishing. Install all the racks and shelvings to keep your gear tidy. Group tackles in accordance with the fish species they are used for and place them in the same container. Manage lures following their purpose. Organize one color soft-plastic baits in the same container. Keep sinkers, hooks, floats, and similar terminal tackle in small compartments. Label the container to identify its content. Clear and dry the box every time you use it. Should I get a general tackle box or the one designed for specialized fishing? If you have chosen a reliable, quality, waterproof, commodious and easily accessible box at a reasonable cost, its design is not that important. The main priority is functionality and durability, while design is the icing on the cake for professional anglers. Tastes and preferences differ, and so do the needs of every single angler. Want your next fishing sessions to be the best experience? 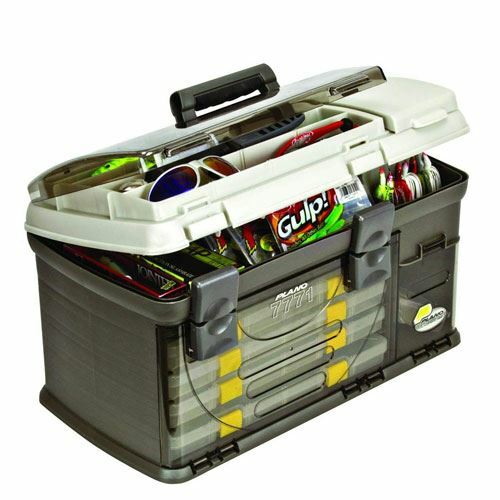 Get one of the best tackle boxes reviewed. Now that you have got detailed information as to how to choose a tackle box and what model suits your budget and storage needs the most, you can be sure to opt for the most convenient one for you personally. Keep all of your lures, baits, lines, and tools safely in one place to enjoy fishing to its fullest.